Remember ModNation Racers? Remember how much you liked United Front Games' surprising racing title built around user-creation? Good. Now, forget ModNation Racers. Sony took the LittleBigPlanet brand and slapped it on a karting title. Meet LittleBigPlanet Karting, developed by the same guys behind ModNation, United Front Games. Does this new console karting game for the PlayStation drive fast enough for your bucks? We've got a love, hate thing going on. I love the creation bits of LittleBigPlanet Karting. I even love a few of the battle tracks in the game. While I can't recall any particular diddies from the story (there's a story, I tried to ignore it), I do remember really enjoying the 50s futuristic levels. When LittleBigPlanet Karting works, it's a charming little beast. When it doesn't? Yeesh. There's rubber-banding here, perhaps as harsh as I've experienced since the dreaded Mario Kart Wii. Rubber-banding is what a racing game does for last place players, NPCs or otherwise. They give last place drivers incredible items and better speed in order to keep races from becoming complete blowouts. While necessary, rubber-banding is unbearable when executed poorly. LittleBigPlanet Karting can be relentless with this "feature." As far as driving goes, this is a complete copy of Mario Kart. Driving is made better with sliding. Slide long enough around turns and you earn two different boosts, the second stronger than the first. Sound familiar? It's too bad that the drifting arrives with flaws. Mario Karts drifting is rock-solid, it has been since the Nintendo 64. 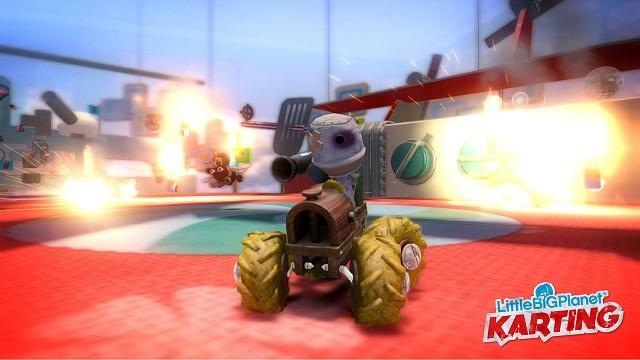 In LittleBigPlanet Karting, you'll regularly mis-steer or overdrift around turns. 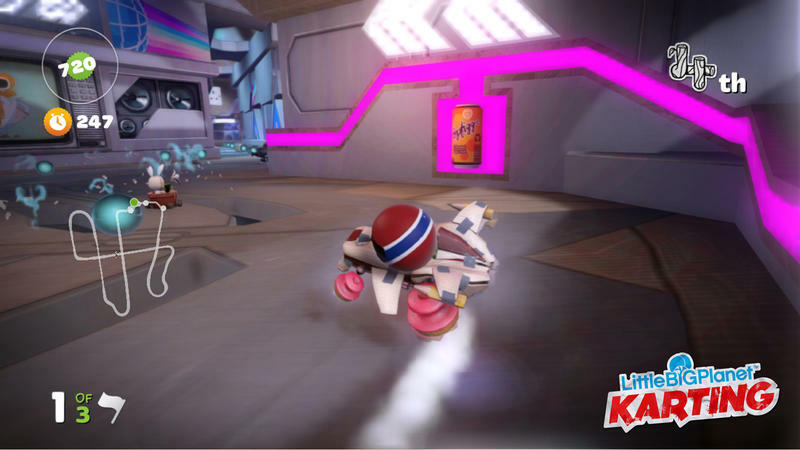 Drift through a power-up or speed boost and you'll get spun around or slam into a wall. There's little in terms of finesse when it comes to the driving. You'll pick up missiles that hone like red shells, missiles that bounce like green shells, missiles that obscure your opponents view like the squid, a boxing glove that acts exactly like the Bullet Bill boost, a mine that's basically a banana peel, a lobbed bomb that's a Bob-omb and the list goes on. Feel like you've been here before? Me too. The thing that's got me down about LittleBigPlanet Karting is how disappointingly devoid it is of original flavor. It feels like a generic karting game with a LittleBigPlanet theme. While I've always loved Sackboy's style and vibe, this karting game does little to make me think about it while I'm away. With Mario Kart, Diddy Kong Racing and even Sonic & Sega All-Stars, my breaks from the game left me thinking about the twists and turns of tracks or their original set pieces. None of that exists here with LittleBigPlanet Karting. The game is fun in action, when the power-ups and driving play nicely, but the actual process of falling in love with each and every theme doesn't work. If you played Mario Kart 64, I bet you could sit right where you are now and recall a handful tracks from the game. Without touching Google, I can immediately think of Moo Moo Farm, Wario Stadium, Frappe Snowland, Yoshi Valley, Kalamari Desert and Rainbow Road. With LittleBigPlanet Karting, I can't even name one. And I just finished playing it. It's that kind of soullessness that I find disappointing with this game. The tracks don't come off as memorable or particularly exciting, and none of them exude the type of personality a great karting game can bring to the table. Don't get me wrong, the levels are hardly bad; but, they aren't great. Creation mode and community are the money makers. As with all things LittleBigPlanet, once you finish the campaign, your work has only just begun. With LittleBigPlanet Karting, though, there isn't much reason to avoid the community levels before beating the campaign. The storyline and its tracks are, as we've already discussed, lackluster. Sure, there are some gems to be driven, but the bulk of the tracks within the main campaign won't have you memorizing every twist and turn. The community, though, is constantly offering up brand new tracks to try. At the time of writing this review, I raced on Mario Kart clones, crazy jungle levels and in a speedboat. Media Molecule created a great system for rating and finding the best levels in their games, and United Front Games has essentially re-released the same deal. There are tons of user-created tracks to experience either alone or online. But, if that's not enough, you have a creation engine that marries the best from LittleBigPlanet with ModNation Racers. You drive the track with a paintbrush to design it, exactly as you did in MNR. Only then you use your Pop-It to populate the track with all sorts of LittleBigPlanet stickers, fabrics and logics in order to make the place buzz with personality. My only gripes with LittleBigPlanet Karting's creation mode come in two flavors. First, you can't build karts from the ground up. You can build them with one found piece at a time, but you can't design a kart quickly and easily from scratch. Second, the track editor does not have an auto-populate tool. In ModNation, once you finish the base of the track, you can auto-populate the trees and do-dads. Here? You have to place each and every thing on your own, making track creation take a whole lot longer than it should. What's going to drive your desire to play this game isn't the base tracks that United Front Games came up with. It's the community. That's not surprising at all, as it's almost always the same way for the LittleBigPlanet franchise. But, the main game just isn't as spirited as it should have been. 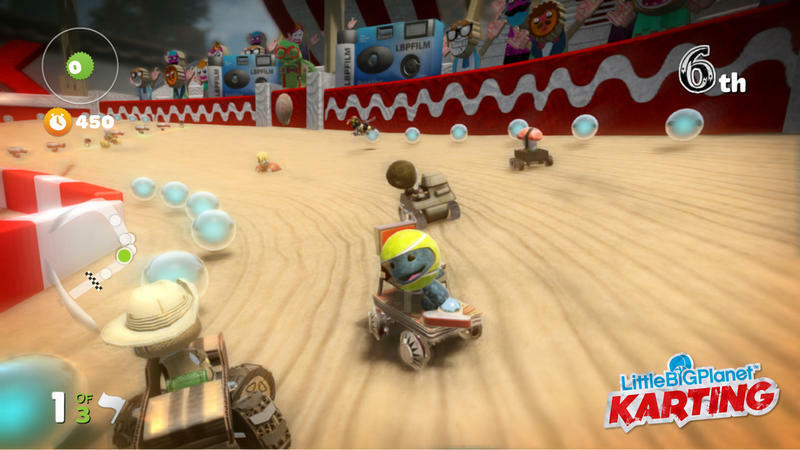 If you can accept decent driving mechanics that arrive with a few hiccups and a clear connection to Nintendo's big karting franchise, there is a lot of fun to be had with LittleBigPlanet Karting. If you love creation, and the community is the exact thing you think you'll fall in love with, LittleBigPlanet Karting is a great choice. We purchased LittleBigPlanet Karting for the PlayStation 3 with company funds. We completed the game's story mode and spent several hours between Creation and Community modes before starting this review.